WORLD’S BEST SURFERS PREPARE FOR HURLEY PRO AT TRESTLES THIS WEDNESDAY! Defending event winner Jordy Smith (ZAF) willl wear the Jeep Leader Jersey at the upcoming Hurley Pro at Trestles. SAN CLEMENTE, California/USA (Wednesday, August 30, 2017) – The world’s best surfers are just one week away from competing at Lower Trestles, located in San Clemente, California, for the Hurley Pro at Trestles. The Hurley Pro at Trestles, Stop No. 8 of 11 on the World Surf League (WSL) Championship Tour (CT) is a crucial mid-way point in the hunt for the world surfing crown. The 2017 Men’s WSL Title race is extremely tight at the top with less than 5,000 points separating the Top 5 on the Jeep Leaderboard and seven different event winners for the opening seven events of the season. Jordy Smith (ZAF) comes into this event as both World No. 1 (for the first time since 2011) and the defending event winner. The South African has earned great results this season, but only 950 points separate him from defending WSL Champion John John Florence (HAW). 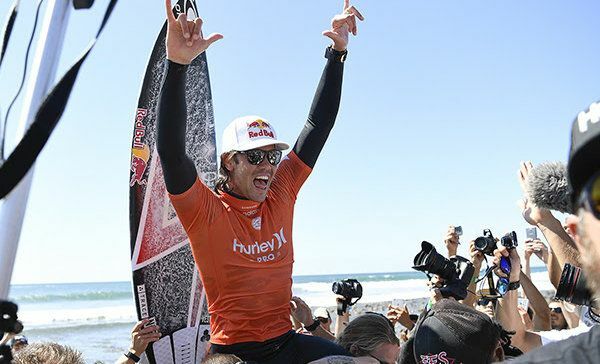 Smith, a two-time event winner, will need to lock in another victory in his adopted home of San Clemente in order to distance himself from his fellow 2017 World Title contenders. Current World No. 2 Florence earned a throw away result at Trestles last year and will look to showcase his innovative surfing at Lowers next week. Coming off two back-to-back Quarterfinal eliminations at J-Bay and Tahiti, Florence is preparing to do battle and break through to the Semifinals for the first time since the Australian leg earlier this season. Hiroto Ohhara (JPN) claimed his place in the Hurley Pro after the winning the trials event and will face Florence and Italo Ferreira (BRA) in Round 1. This will be the second appearance at Lower Trestles for Ohhara who was defeated by Josh Kerr (AUS) in Round 2 back in 2015. Currently at 10th place on the Qualifying Series rankings, Ohhara is keen to improve on his previous 25th place finish. Evan Geiselman (USA) also earned his place in the main event for the second time following success at the trials event. Geiselman also competed in the event back in 2012 where he was eliminated by Florence in Round 2. Fresh from a third-place finish at the recent Vans Pro in Virginia Beach, USA, the Floridian will take on Smith and Ian Gouveia (BRA) in the opening round of competition. The first few days of the waiting period look slow at this time with a small mix of southerly swells. The second half of the waiting period looks a bit more promising with potential for fun size S swells. Surfline. The Hurley Pro runs in conjunction with the Swatch Pro and both will be broadcast LIVE via WorldSurfLeague.com, the WSL app and on Facebook LIVE via the WSL’s Facebook page. Also check the local listings for coverage on CBS Sports Network in the U.S., Fox Sports in Australia, ESPN in Brazil, Sky NZ in New Zealand, SFR Sports in France and Portugal, Sport TV in Portugal and the EDGEsport Network.